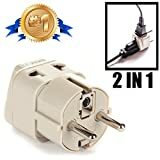 The electrical receptacles used in Czech Republic are type E. You will therefore need a US to type C/E adapter in order to plug in your appliances. Special considerations - Type E sockets are standard, earthed appliances ship with an E+F plug. Type C Plugs are common, especially for low-power devices. 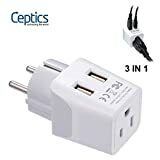 Type C wall sockets (actually E without the grounded pin and with narrower holes) are very uncommon, and exist only in very old installations.